This shirt went through the same degree of customization that my suit did. After picking a material from his fabric swatchbooks, we went on to choose a style and cut. Again, the attention to detail is outstanding. 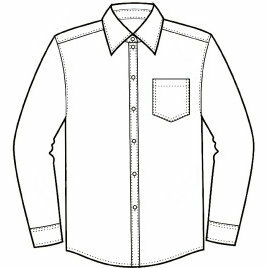 For example, pocket(s) could be specified to be rounded or angular, corners kept or octagonal and so on. The comprehensive measurements he had taken with the suit were kept in a database so I did not have to do it again. I chose the interchangeable collar which was neat to help deal with the different materials, lengths, cuts and knots that ties can have. As another review had written, Mr. Magnoli is very responsive and committed to the quality of his pieces. However, they are pricey and there isn't anything really wrong with my other shirts so I can't imagine buying more than a couple of these, as nice as they are. Still, if you must have your shirt specified in an exact way, this service is certainly recommended.